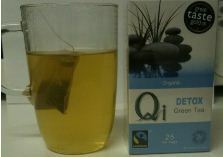 Qi sent me 3 teas to try and give away – Detox tea, vanilla tea and orange spice tea. Each one had a completely unique flavour and character and was completely different. This is not some mass-market tea with flavour added to black tea – all this tea has been carefully made and balanced. This tea was a departure from the other tea I’d been drinking this week which were mostly whole leaf teas and mainly jasmine. Each of these teas is made from a different base tea and the flavours are meant to compliment them. They are organic meaning you get no nasty pesticides in each mug. Apparently Qi teas are sourced from three carefully selected organic tea gardens in the Huang Shan – Yellow Mountains. Each tea garden is different and produces a tea which has its own distinctive taste, colour and aroma according to their promotional stuff. Detox tea – without realising it, I’d been drinking healthy tea. Green tea is good for you and I’ve been drinking a lot of it recently. Great! More booze then… 🙂 This green tea is slightly more bitter than what I’ve been drinking but this can also be because it is combined with the citrus flavours of orange and lemon which add to it a very unique flavour along with Dandelion root and milk thistle seed. Apparently these work together and in harmony with green tea’s diuretic properties to cleanse the system and restore its own natural balance and harmony. Not my favourite of the teas I’m afraid but as I drank it I knew I was doing my body some good and it helped me get through it. 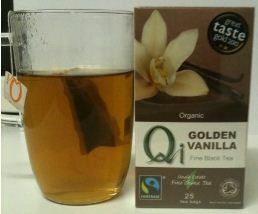 Golden Vanilla Tea – This is a black tea with a strong vanilla flavour and scent. It’s slightly different than I would have expected but I don’t do much vanilla anything – not even ice cream. Since my life is far from vanilla I wasn’t sure I’d like this tea but surprisingly I did like it. I might not drink it all the time but paired wither with a Green and Blacks white chocolate bar or maybe butterscotch it would be ok. This tea received 2 gold stars at the Great Taste Awards too so I’m thinking that people who like vanilla might like this tea too. 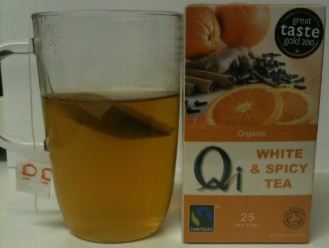 White and Spicy Tea – I think this was probably my favourite of the three teas sent. It still is outside what I’d normally choose but when I’m low carbing I think this might be my new best friend. The combination of tea (green or white) with cinnamon is often recommended to control sugar levels which you really need to do with low carb (and diabetes). According to the bumph the delicate sweetness of authentic Qi White tea and cinnamon deliciously blended with warming cloves and ginger and enhanced with the light taste of orange is what makes this tea so great. While it is the best of the three I’d probably choose Canton or Newby for my regular green tea health kick. We have our winner of all the tea and chocolate! Congratulations to @melspur for winning! The teas sound delicious, a interesting combination with the chocolate.